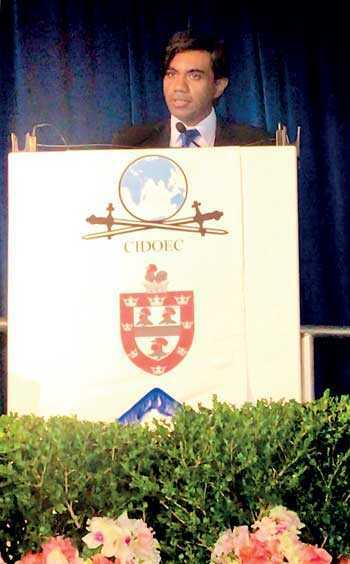 Institute of National Security Studies Sri Lanka (INSSSL) Director General Asanga Abeyagoonasekera was invited to speak at the 36th International Economic Crime Symposium held at Jesus College Cambridge University from 2-9 September. Abeyagoonasekera’s paper was on ‘Unexplained wealth and for what purpose: A Sri Lankan perspective,’ which referred to circulation of unexplained wealth in the economy and its implications to policy making which has threatened national security. Bastiat correctly identifies the way a group of people manage to plunder the wealth and use the state legal system to justify the unexplained wealth. His paper was well received by the Chair Bonnie Lano Rippingille, former Judge, member of Florida Bar, USA and the audience. There were over 1,000 experts from around the world sharing their experience and knowledge with other participants drawn from policymakers, law enforcement, compliance, regulation, business and the professions. The annual Cambridge Symposium’s primary purpose is to provide a vehicle for those involved in protecting the integrity of their institution or society, to meet and explore how more meaningful international understanding and cooperation may be fostered.